Susan Seidelman’s Desperately Seeking Susan (1985) is an exemplary feminist film. This adventure takes place amidst the colorful scenery of downtown New York City in the early 1980s. Rosanna Arquette is Roberta, a bored New Jersey housewife who follows the personal ads in the newspaper as a means of indulging her escapist fantasies. Through the ads, she discovers Susan (Madonna), the embodiment of a sassy cool chick ideal, and hijinks ensue. Identity is not fixed in Desperately Seeking Susan, as it is in many chick flicks. Roberta and Susan can be viewed in terms of good girl and bad girl, respectively, but there is fluidity within these categories. This can be seen even in something as simple as hair color. Both women are blonde. The hair color allows for more than just the plot device of Roberta being mistaken for Susan. It effectively disrupts the pop cultural tradition of good girl and bad girl being blonde and brunette, as exemplified in Betty and Veronica comic books, and Vertigo. The world of Desperately Seeking Susan brims with the punk energy of the time. Punk is framed not as the dangerous other, but as a safe space in which identities can be explored and experimented with. Aesthetic codes are rewritten in the subversive language of punk. Susan’s style is a hodgepodge of girly and tough, and when Roberta attempts to imitate it, we see that she interprets it through a more typically feminine filter. She dresses like Susan, but just a bit more girly, in pastel pants and a too-oversized hair bow, and at first she doesn’t look entirely comfortable in her lace gloves. The only person who faults her for her style is her clueless husband, who, upon seeing her clad in Susan’s jacket, a key plot device of the film, bought at an East Village thrift store, looks at it with disgust, and asks, “You bought a used jacket? What are we, poor?” In the punk make-over scene, Roberta is free to reinvent herself. The fact that her pale violet jeans may appear slightly out of place doesn’t matter. Punk style is meant to be a collage, in which disparate elements come together in a whole of unique and aesthetically intriguing self-expression. This opportunity for reinvention, aside from being a major theme in Madonna’s career, gives hope to Roberta’s bored housewife. Susan’s downtown haunts represent spaces in which Roberta can finally play with her identity and no longer feel so frustratingly locked into her housewife role. In a 1985 interview with People magazine, Seidelman confirmed the feminist identity fluidity of her film. She said, “Part of me is like Roberta. My roots are in the suburbs, and her life could have been mine. And part of me is like Susan. I’m not as free spirited as she is, but I find her existence appealing on a fantasy level—very romantic and unbourgeois.” This statement mirrors how many female audience members are likely to relate to the film. We don’t have to identify with one character in order to enjoy the viewing experience, but can can find can elements of ourselves in both women. Susan would be the stock “slutty” bad girl in a non-feminist film, but here is presented as someone we can aspire to be like, sharing Roberta’s admiration. As a female director, Seidelman is attentive to the nuances of female characters. Desperately Seeking Susan is made all the more powerful by the way these subtleties are amplified by over-the-top aesthetics. Susan’s outfits verge on costume, but she herself is no caricature. Countless scenes illustrate Susan’s confidence, but the most amusing one comes late in the film. Susan, clad in a man’s button-down, boxer shorts, and garter-affixed white lace thigh highs, goes to the offices of the newspaper to drop off a personal ad. As she approaches the building, three identical men smile at her appreciatively. If looked at the scene within the larger context of feminism, it becomes a humorous play on the male gaze and female sexual display. By having not just one man, but three men who look alike, check Susan out, Seidelman mocks our conventions of the male gaze. The gaze provides cartoonish amusement for both Susan and the audience.This exaggerated gaze does not offend Susan. Rather, she seems to enjoy it, as she smiles back. At the same time, though, we sense that in being scantily clad and smiling, Susan still projects power. Though Susan is technically the object of the three men’s gaze, she is anything but objectified. The gaze is greeted with a wink. Susan is never objectified because she is a well-developed character who shows signs of an inner life, unlike so many onscreen females. Early on, we see Susan in a bathroom at Port Authority, going through the contents of her carryon. Her skull-patterned suitcase holds countless funky accessories, fragments of an artistic and free-spirited existence. Nothing in the suitcase seems particularly practical—we see costume jewelry and crop tops but no necessities. When we imagine the contents of Roberta’s bag, we know for sure that there are no crop tops to be found, and she likely always checks to make sure her wallet is packed. Susan shuns practicality, but, at the same time, her collection of items does not feel frivolous. It feels essentially Susan, and it would seem false for her suitcase to be well organized and practical. Seidelman was attuned to all the details of her characters. In an online interview, she described the importance of style in her film, saying her interest in this area likely arose from her childhood dream of being a fashion designer. 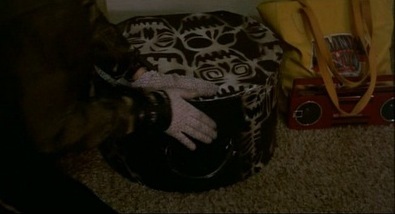 Susan’s hodgepodge of colorful belongings illustrates Seidelman’s point that, “you can use the details of clothing to tell a lot about a character.” Clothing does not have to be superficial. There is a jumbled quality to Susan’s style. She is not one for subtlety, and we appreciate her all the more for it. Her accessories are piled on, and she shows her bra with nonchalance unseen in most films before this point. When we look at Susan’s mess of accessories, we wonder how she came to accumulate them. Her style is not prefabricated, and it seems that each rosary and rubber bracelet must have some narrative behind it. Just as Roberta dreams up a fantasy based on Susan’s personal ads, we can extrapolate on Susan’s style, imagining where her clothing and accessories came from and how she decided to put them together. Fashion designer (and tastemaker in the stylish new wave milieu Madonna inhabited) Betsey Johnson once said that women don’t dress for men, they dress for themselves and other women. Desperately Seeking Susan is a case in point. Seidelman knows and appreciates Johnson’s observation. Roberta is far more intrigued by Susan’s wardrobe than any of the men in the film are. Susan’s style is liberating. She plays dress-up every day. To Roberta, initially clad in dowdy secretarial blouses and slacks, Susan’s personal style represents a feminist escape. As a woman interested in fashion, Seidelman skillfully plays to the female audience’s sartorial interests. We too can’t help but fantasize about dressing in this way—impractical but fun, and flashy yet rooted in one’s ongoing story. Janet Maslin’s contemporary review of the film referred to it as, “full of astonishing props.” Susan’s suitcase and its contents rank highly among these objects. The very act of filling the diegetic world with “astonishing props” is feminist. In realizing her vision of the film, Seidelman acts as the homemaker, though this home is filled with items like a pink, shell-encrusted telephone (Maslin’s favorite) and all other matter of perfectly new wave bric a brac. Attention to detail is typically gendered as feminine, and within this stylized world, this gender convention does not oppress, but rather manifests itself in creative expression and a fully realized aesthetic. One of the defining details of Desperately Seeking Susan, and early Madonna in particular, is the lace gloves she often wears. The gloves are a physical reminder of the fluidity of female identity within the film. On their own, lace gloves seem like a prim, ladylike accessory—hardly the thing for a free spirit like Susan to wear. But the gloves make perfect sense with Susan’s outfits. She reclaims feminine delicacy, making it feminist. The gloves are a counterpoint to her punkish ensembles. In their seeming incongruity, they become subversive and take on new meaning as a feminist accessory. Early in the film, Susan walks down the street eating Cheez Doodles while wearing the gloves. 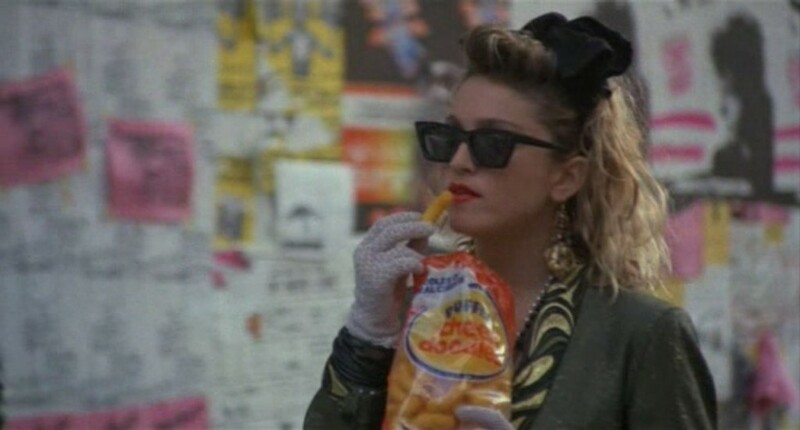 The inelegance of the Cheez Doodles, combined with the delicate gloves, heaps of jelly bracelets, oversized sunglasses, and layered new wave outfit, creates an original, wholly engaging portrait of femininity. Susan is not an object, but a self-assured woman enjoying herself. It is a disservice to dismiss Desperately Seeking Susan as a chick flick or a piece of 80s fluff. The fact that the film conveys a feminist attitude while remaining fun and filled with pop cultural pizzazz makes it all the more valuable. Seidelman rewrites typical feminine roles and critiques the idea of the male gaze in a lighthearted way. In her book Feminist Hollywood: From Born in Flames to Point Break, Christina Lane writes that the film shows, “visual economy based on a series of female ‘looks’… a world of fantasy that facilitates feminist enlightenment.” The female gaze takes precedence over the male one. When we look at Susan, we identify with Roberta’s gaze—we see Susan’s enviable confidence, instead of solely viewing her sexually. Though both women end up in relationships, “feminist enlightenment” is the real happy ending of the film. As Roberta begins to have fun with her appearance, shedding her bland, tailored outfits for a colorful mélange of new wave style, she becomes able to express herself. The essential realization that identity is malleable is largely based on Susan’s playful aesthetic. The lace gloves are deceptive in their seeming frivolity. With the right accesories, they signify boldness and the playful becomes political.